Is the Answer to the Question Below? If this carving is Moses, there is NO resemblance at all to Akhenaten! Photo added 1-3-00 - Profile of Moses/Yeshua with references to Masonic order. (Notice pyramid and Menorah above the head) Essene priesthood, 8 pointed star again, Venus sun, traveling by sea, Lord of the Sun and Moon . (suggesting the Pharaonic order.. the royal bloodline) Exerpted from Robert Ghostwolf - Hall of Records (page no longer available. I have learned things about my two legged ancestors from the pieces I have found that they left behind so that I would know. They had swords, and they wore leather. And some wore armor. They wore skins and danced with the Spirits. They wore feathers, and sandals as well as shoes and moccasins, and fine silk, yes here in America long ago. Some were very tall. Some lived in pueblos, and others rode upon Elephants I am told, in the messages they left behind Yet that happened here in America, and not some far off land. I see the world through the eyes of my ancestors and in many ways I fit into neither their world, nor the present world of material madness. To me this corporate society is alien to this Earth I love so deeply, as alien as the English language. The native people today are as lost as anyone else. Now I hear many calling themselves the First Nations People. We are not Native Americans we are First nations People. Well there was quite frankly someone here before what presently are referred to as the Native Americans. I have touched the carvings of ancient Egyptians in the New Mexico and Arizona Deserts in Colorado, and in Illinois. I stood in awe of statues of Horus and RA that towered over me carved in the fire pink stone of the desert caves, those who carved these effigies, perhaps they were the Native Americans? I have seen with my own eyes bodies that were ten and twelve feet in height buried in crypts wearing armor, draped in silk and cotton cloth, and carrying huge broad swords were these the Native Americans? Conventional history says they could not be, but there are things that historians have neglected to include in the books we were taught from back in school. Jan Assmann both defines and practices in his book, the study of historical memory--a study, in this case, of the ways in which factual and fictional events and characters are stored in religious beliefs and transformed through philosophical justification, literary reinterpretation, philological restitution (or falsification), and psychoanalytic demystification. To account for the complexities of the foundational event through which monotheism was established goes back to the short-lived monotheistic revolution of the Egyptian king Akhenaten (1360-1340 B.C.E.). The TURIN PAPYRUS OF KINGS, also called The TURIN CANON, is a Papyrus written during the reign of the Pharaoh Rameses II (i.e., RA-MOSES, the Pharaoh of Exodus, 1300 B.C.). Muslim Dating: We have, however, no record that Egyptians used crucifixion as punishment in the time of Moses (1450 BC, conservative date; 1200 BC at the latest) or even Joseph (1880 BC, conservative date). Crucifixion only becomes a punishment much later in history and then first in another culture before it has been taken over by the Egyptians. Such threats by a Pharaoh at these times are historically inaccurate. 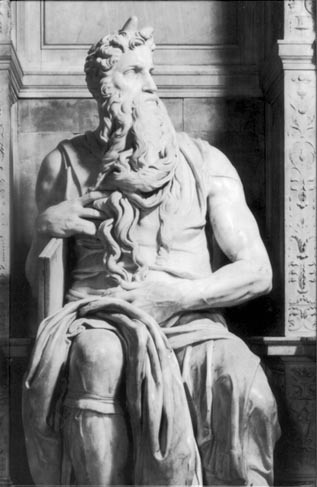 The biblical chronology dates the birth of Moses to around 1527 BC. In the new chronology of Egypt, the pharaoh on the throne of Egypt was Neferhotep I of the 13th Dynasty. Ar: Musa, Heb: Mosheh ( ). Corresponds to the Biblical Moses who brought the Taurat (Torah). Moses is called the Speaker with God in Islam; the name of Moses occurs 136 times in the Qur'an, the highest among all the prophets. Artapanus writes that a pharaoh named Palmanothes was persecuting the Israelites. His daughter Merris adopted a Hebrew child who grew up to be called prince Mousos. Merris married a pharaoh Khenephres. Prince Mousos grew up to administer the land on behalf of this pharaoh. He led a military campaign against the Ethiopians who were invading Egypt; however, upon his return, Khenephres grew jealous of his popularity. Mousos then fled to Arabia to return when Khenephres died and lead the Israelites to freedom. It may be only a Mosaic story with similarities to the biblical account, yet the only pharaoh with the name Khenephres was Sobekhotep IV, who took the name Khaneferre at his coronation. He reigned soon after Neferhotep I of the 13th Dynasty, as mentioned above, the pharaoh in power at Moses' birth! Josephus in his Antiquities of the Jews', with access to very old manuscripts and writing in AD 93, also mentioned Moses' Ethiopian or Kushite war. Here, Moses led an Egyptian army down the Nile valley, past the Third Cataract, deep into Kush (modern Ethiopia). In the British Museum is a stela (page 261, fig. 289) which tells of a 13th Dynasty pharaoh undertaking a campaign south into the region of Kush. That pharaoh is none other than Khaneferre, the step-father of Moses according to Artapanus. He is the only 13th Dynasty pharaoh who is recorded as having campaigned into Upper Nubia or Ethiopia. At Kerma on the Nile an official Egyptian building was found, outside of which was discovered a statue of Khaneferre, so dating this building to the 13th Dynasty. This is many hundreds of kilometers south of the known boundaries of 13th Dynasty Egypt and may have been a governor's residence'. It would have been built to secure Egyptian interests in the area after the military victory of the Egyptians led by Moses, as this was the only Kushite war at that time with Egypt. As Moses was a prince of Egypt and was 40 years old according to the Bible when he fled to Arabia, he could certainly have led this military operation - an Israelite leading an Egyptian army to war! If this part of Josephus' account is true then it adds weight to the rest of his account of the life of Moses and also gives us some firmer evidence of the existence of this charismatic leader! The scholar and Genealogist of the Holy Bloodline of Jesus, Laurence Gardner, has this to say in his book "Bloodline of the Holy Grail"
It is now generally acknowledged that the opening chapters of the Old Testament do not accurately represent the early history of the world, as they appear to suggest. More precisely, the tell the story of a family - a family that in time became a race comprising various tribes; a race that in turn became the Hebrew nation. If Adam can ever be said to have been the first of a type (notwithstanding the whole of human evolution behind him), then he was certainly the progenitor of the Hebrews and the tribes of Israel. Two of the most intriguing characters of the Old Testament are Joseph and Moses. Each played an important role in the formation of the Hebrew Nation, and both have historical identities that can be examined quite independently of the Bible. Genesis 41:39-43 tells how Joseph was made Governor of Egypt. And Pharoah said unto Joseph...Thou shalt be over my house, and according unto thy word shall all my people be ruled; only in that throne will I be greater than thou...and he made him ruler over all the land of Egypt. Moses was very great in the land of Egypt, in the sight of Pharoah's servants, and in the sight of the people. Yet for all of this status and prominence neither Joseph nor Moses appear in any Egyptian record under either of those names. The annals of Rameses II (1304-1237 BC) specify that Semitic people were settled in the land of Goshen. It is further explained that they went there from Canaan for want of food. But why should Rameses' scribes mention this settlement at Goshen? According to standard Bible chronology the Hebrews went to Egypt some three centuries before the time of Rameses, and made their Exodus in about 1491 BC, long before he came to the throne. So, by virtue of this first-hand scribal record, the standard Bible chronology as generally promotes is seen to be incorrect. It is traditionally presumed that Joseph was sold into slavery in Egypt in the 1720's BC, and was made Governor by the Pharoah a decade or so later. Afterwards, his father Jacob (Israel) and 70 family members followed him into Goshen to escape the famine in Canaan. Notwithstanding this, Genesis 47:11, Exodus 1:11 and Number 33:3 all refer to 'the land of Rameses' (in Egyptian, 'the house of Rameses'). This was a complex of grain storehouses built by the Israelites for Rameses II in Goshen some 300 after they were supposed to be there! It transpires, therefore, that the alternative 'Jewish Reckoning' is more accurate that the 'Standard Chronology'; Joseph went to Egypt not in the early 18th Century BC but in the early 15th Century BC. There he was appointed Chief MInister to Tuthmosis IV (ruled c. 1413-1405 BC). To the Egyptians, however, Joseph the Vizir was known as Yuya, and his story is particularly revealing not just in relation to the Biblical account of Joseph but also in respect of Moses. The Cairo-born historian and linguist Ahmed Osman has made an in-depth study of these personalities in their contemporary Egyptian environment, and his findings are of great significance. When Pharoah Tuthmosis died, his son married his sibling sister Sitamun (as was the Pharonic tradition) so that he could inherit the throne as Pharoah Amenhotep III. Shortly afterwards he also married Tiye, daughter of the Chief Minister (Joseph/Yuya). It was decreed, however, that no son born to Tiye could inherit the throne. Because of the overall length of her father Joseph's governorship there was a general fear that the Israelites were gaining too much power in Egypt. So when Tiye became pregnant, the edict was given that her child should be killed at birth if a son. Tiye's Jewish relatives lived at Goshen, and she herself owned a summer palace a little upstream at Sarw, where she went to have her baby. She did indeed bear a son but the royal midwives conspired with Tiye to float the child downstream in a reed basket to the house of her father's half-brother Levi. The boy, Aminadab (born around 1394 BC), was duly educated in the eastern delta country by the Egyptian priests of Ra. In his teenage years he went to live at Thebes. By that time, his mother had acquired more influence than the senior queen, Sitamun, who had never borne a son and heir to the Pharoah, only a daughter who was called Nefertiti. In Thebes, Aminadab could not accept the notion of Aten, an omnipresent God who had no image. 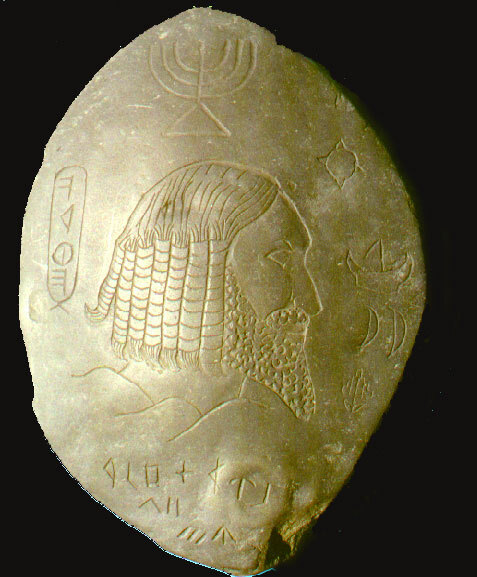 Aten was thus an equivalent of the Hebrew "Adonai" (a title borrowed from the Phoenician and meaning 'Lord') in line with Israelite teachings. At that time Aminadab (Hebrew equivalent of Amenhotep - 'Amun is pleased') changed his name to Akhenaten (servant of Aten). Pharoah Amenhotep then suffered a period of ill health. Because there was no direct male heir to the royal house, Akhenaten married his half-sister Nefertiti in order to rule as co-regent during this difficult time. When in due course Amenhotep III died, Akhenaten was able to succeed as Pharoah - officially called Amenhotep IV. Akhenaten and Nefertiti had six daughters and a son, Tutankhaten. Pharoah Akhenaten closed all the temples of the Egyptian gods and built new temples to Aten. He also ran a household that was distinctly domestic - quite different from the kingly norm in ancient Egypt. One many fronts he became unpopular - particularly with the priests of the former national deity Amun (or Amen) and of the sun god Ra (or Re). Plots against his life proliferated. Loud were the threats of armed insurrection if he did not allow the traditional gods to be worshipped alongside the faceless Aten. but Akhenaten refused, and was eventually forced to abdicate in short-term favour of his cousin Smenkhkare, who was succeeded by Akhenaten's son Tutankhaten. On taking the throne at the age of about 11, Tutankhaten was obliged to change his name to Tutankhamun. He, in turn, was only to live and rule for a further nine or ten years, meeting his death while still comparatively young. Akhenaten, meanwhile, was banished from Egypt. He fled with some retainers to the remote safety of Sanai, taking with him his royal sceptre topped with a brass serpent. To his supporters he remained very much the rightful monarch, the heir to the throne from which he had been ousted, and he was still regarded by them as the Mose, Meses or Mosis (heir/born of) - as in Tuthmosis (born of Tuth) and Rameses (fashioned of Ra). Evidence from Egypt indicates that Moses (Akhenaten led his people from Pi-Rameses (near modern Kantra) southward, through Sanai, towards Lake Timash. This was extremely marshy territory and, although manageable on foot with some difficulty, any pursuing horses and chariots would have foundered disastrously. Among the retainers who fled with Moses were the sons and families of Jacob (Israel). Then at the instigation of their leader, they constructed the tabernacle at the foot of Mount Sanai. Once Moses had died, they began their invasion of the country left by their forefathers so long before. But Canaan (Palestine) had changed considerably in the meantime, having been infiltrated by waves of Philistines and Phoenicians. The records tell of great sea battles, and of massive armies marching to war. At length, the Hebrews (under their new leader, Joshua) were successful and, once across the Jordan, they took Jericho from the Canaanites, gaining a real foothold in their traditional Promised Land. Following Joshua's death, the ensuing period of rule by appointed 'judges' was a catalogue of Jewish disaster until the disparate Hebrew tribes united under their first king, Saul, in about 1055 BC. with the conquest of Palestine (Canaan) as complete as possible, David of Bethlehem - a descendant of Abraham - married Saul's daughter to become King of Judah (corresponding to half the Palestinian territory). By 1048 BC, he had also acquired Israel (the balance of the territory) becoming overall King of the Jews. The Bloodline of the Holy Grail had begun. This shrine stela also from the early part of the Amarna period depicts Akhenaten, Nefertiti, and Princesses Meretaten, Mekeaten, and Ankhesenpaaten worshiping the Aten as a family. Dorothea Arnold in her article "Aspects of the Royal Female Image during the Amarna Period" discusses the plethora of reliefs depicting intimate family moments. While Akhenaten leans forward to give Meretaten a kiss, Mekeaten plays on her mother's lap and gazes up lovingly. 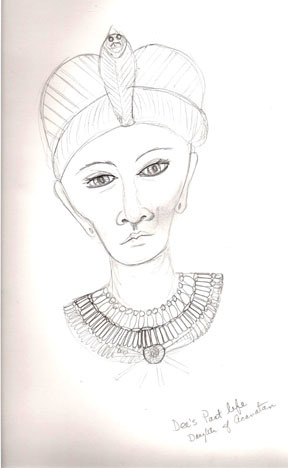 At the same time Ankhesenpaaten, the smallest, sits on Nefertiti's shoulder and fiddles with her earring. Arnold claims that the shrine stela "relates to the Aten religion's concept of creation" in which the King and Queen are viewed as "a primeval 'first pair." 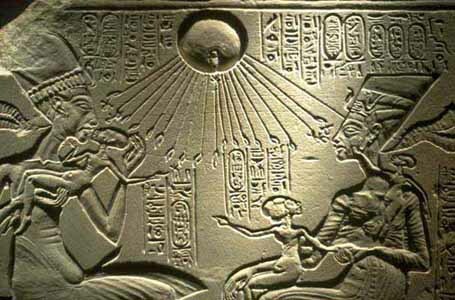 At the top of the composition, the sun-god, Aten, represented by a raised circle, extends his life-giving rays to the Royal Family. The relief uses the concept of the "window of appearances" or a snapshot of life. The figures are framed by a fictive structure which suggests the form of a square window. Aldred in his book Egyptian Art calls this "a brief moment in the lives of five beings as they are caught in an act of mutual affection". In actuality, the royal palace at Akhetaten had a window from which the royal couple could observe the city and address their subjects. It is accepted that Akhenaten and Nefertiti had six daughters. No son was ever shown in reliefs. The names of the daughters were; Meritaten (1349 BC) - Meketaten and Ankhenspaaten (1346 BC) - Neferneferuaten (1339 BC) - Neferneferure and Setepenre (1338). In 1337 BC the official family, with all six of Nefertiti's daughters was shown for the last time. In 1336 BC Meketaten died in childbirth. In 1335 Nefertiti seemed to vanish, assumed dead. This limestone relief found in the Royal Tomb at Amarna depicts Akhenaten, Nefertiti, and two of their daughters making an offering to the sun-disk Aten. Akhenaten and Nefertiti carry flowers to be laid on the table beneath the "life-giving" rays of the Aten. The figures are carved in the grotesque style, a characteristic of the early half of the Amarna period. Nefertiti, sporting the double plume headdress mentioned in the stela dedication, is the petite figure placed behind her larger scale husband. The compostion mirrors early artistic representations of the royal couple. To emphasize the strength and power of the pharaoh, Egyptian iconographical tradition required the female figure to be smaller in scale than the male. Akhenaten's minor wives includeD Merytaten, Kiya, Mekytaten, and Akhesenpaaten. Akhesenpaaten was also a wife to her brother King Tut. The spirit who appeared before Mikki to have her picture drawn said to Mikki after the picture was done, "Don't you recognize me? Past life journeys to the time of Ahkenaten on various occasions showed great love by Akhesenpaaten for her father and that all the daughters were very happy children. Another time, Dee asked to see her mother Nefertiti and she was shown a time after the death of her father Ahkenaten, and her mother Nefertiti was madly in love with her lover Ay. Could it be that the first six ages, (Capricorn, Sagittarius, Scorpio, Libra, Virgo and Leo), were the renowned six days of creation? Then could it be that the following Age of Cancer occurring about 8,850 B.C. would be exemplar as the Fall of Adam and the coming of the Flood? Continuing on into the Age of Gemini around 6,690 B.C. with Noah and the Fall of Babylon, which followed with Abram's metamorphous to Abraham and then came the bull-worshipping Pharaohs of Taurus in 4,530 B.C. The next Age of Aries around 2,370 B.C. brought on the Exodus and the Old Testament of Moses to the civilized world. Amram (Heb. �Amram, am-rawm�, probably from Heb. �am, people, tribe, nation, and Heb. ruwm, room, to be high, rise up, exalt, thus meaning high people, or people exalted) told his wife Jochebed (Heb. Yowkebed, yo-keh�-bed, from Heb. Yehovah contraction and Heb. kabad, kaw-bad, or kabed, kaw-bade�, to be heavy, glorify, glory, thus meaning Jehovah-gloried, also yokhevedh, Jehovah is glory) and after the child was born they nursed him for three months till forced to set him afloat in an ark of bulrushes upon the river to be left for its preservation by God. Thermuthis (Thutmose II, married his half-sister, Hatshepsut) the king's daughter saw the child in the cradle, who brought a Hebrew woman to nurse the infant. She named him Mouses which Mo means 'water or river' and Uses means 'saved out of.� He was the seventh generation from Abraham. The Hebrew word for Moses is moseheh, Egyptian mes, drawn out, born. More formal as the Hebrew Mosheh, mo-sheh�, from Heb. mashah, maw-shaw�, a primary root, to pull out (lit. or fig. ), draw (out), thus meaning drawing out (of the water), i.e. rescued, Mosheh, Moses. In the Talmud (a collection of ancient Rabbinic writings of Orthodox Judaism compiled about A.D. 200) it states Moses' mother placed him in an ark of bulrushes in the brink of the river, where he was found by Bathia, Pharaoh's daughter, she adopted him and brought him up as Prince Ahmose at the Egyptian Court. The Biblical version is in Exodus 2:1-10. If the Exodus occurred at 1440 B.C. then the 18th Dynasty of Thutmose III (1504/3?-1450/47 B.C.) and his mother Hatshepsut (1503-1482), the woman king, would be considered Moses protectors. Hatshepsut, the queen was forced to flee during the reign of Thutmose III. "Moses was an initiated priest of Amon and the presumed son of Pharaoh's daughter. At the time of his appearance in Exodus, Egypt had fallen into idolatry." Quote from "The Moon: Outpost of the Gods" Jean Sendy page 38.
of Pharaoh's daughter. At the time of his appearance in Exodus, Egypt had fallen into idolatry." Quote from "The Moon: Outpost of the Gods" Jean Sendy page 38. Moses� understanding and apprehension became superior to his age, thus Thermuthis adopted him as her own. Josephus asserted that the Scribes and the king eventually knew that Moses was the one of the Prophecy but did not slay him because of the king's daughter. In Acts 7:22 Stephen in an address to the Sanhedrin asserts that Moses was not only instructed in the science and learning of the Egyptians but was also endowed with oratorical ability and distinctive leadership qualities. After 40 years of age, he killed an Egyptian which made him flee from the Pharaoh to Midian where he stayed for forty years in seclusion. At the death of the great Pharaoh, God appeared in a burning bush to Moses. An oddity here is that God declared that Aaron should be spokesman for his brother (Exod. 4:10-16) before going to Goshen. The new monarch Amenhotep II (1447-1421 B.C.) was probably the Pharaoh of the 10 plagues of Exodus which probably took place in the spring of 1446 B.C. (some scholars believe it to be 1290 B.C.). Solomon�s temple in 966 B.C. plus 480 years to the Exodus equals 1446. The Hebraic Tradition, the Kabbala, has its roots in prehistoric times, with Moses, it is recent enough to spare us to reason on the basis of hearsay. Beyond question the two symbols of the religion of Moses are the Ram (Aries) and the Scales (Libra). The scales are a symbol for justice, as the whole age of Aries was destined to bring a certain type of justice. There is no definite reference to Moses in Egyptian texts, but there is a great relationship between the Egyptian Akhnaton and Moses in activities and events. The old religion of Egypt at one time had lost its inspiration because materialism was increased and a reformation was greatly needed. Akhnaton had a definite relationship between himself and the priest of Amon. Moses was the spiritual heir of 'Joseph of the Fat Cows.' He reproached Pharaoh for forgetting Joseph's teachings. in Gemini in Noah's time, in Taurus in the time of the Pharaoh's Apis, and his own time in Aries, which were no longer known by the Pharaoh's priests. Rameses II also Ramesses II or Ramses II known as "Rameses the Great," 14th-13th century B.C., King of Egypt (1304-1237 B.C.) whose reign was marked by the building of numerous monuments. He was probably king during the Jewish exodus from Egypt only if Solomon�s temple was built in 810 B.C. The 156 year variation is still in dispute among archaeologist to date. Exodus 14:19 "And the angel of God, which went before the camp of Israel, removed and went behind them: and the pillar of the cloud went from before their face and stood behind them:" 14:20 "And it came between the camp of the Egyptians and the camp of Israel; and it (a barrier) was a cloud and darkness (symbol of wrath) to them, but it gave light (symbol of favor) by night to these: so that the one came not near the other all the night." The pillar of cloud, was a slow and silent movement of a majestic column through the air, that exited the Israelites. Exodus 20:18 "And all the people saw the thunderings, and the lightnings, and the noise of the trumpet, and the mountain smoking: and when the people saw it, they removed, and stood afar off." Then a few verses later 20:21 "And the people stood afar off, and Moses drew near unto the thick darkness where God was." In Deut. 4:11 and 5:22 the LORD spoke to all of Israel face to face from under the mountain out of the midst of heaven "..mountain burned with the fire, of the cloud (clouds), and the thick darkness, with a great voice .." but they only heard the voice coming out of the midst of the fire, and they saw no similitude (resemblance or comparison). In 4:32 "�and ask from the one side of heaven unto the other, �"
Judges 5:4 "LORD, when thou wentest out of Seir, when thou marchedst out of the field of Edom, the earth trembled, and the heavens dropped, the clouds also dropped water." The kings came to fight the kings of Canaan in the fortified city of Ta�-a-nach (Heb. ta�anak, possibly Ta�annuk) a tell or mound in the plain of Megiddo or Esdraelon (now Leijun) and in Judges 5:20 "They fought from heaven; the stars in their courses (a fearful tempest burst upon them and threw them into disorder) fought against Sis�-e-ra." It is interesting to note that in the Denderah Zodiac, Cassiopeia is called Set, which means "Set up as a Queen," and is associated with the The Birth Of Moses Cassiopeia" "The Birth of Moses and Cassiopeia" constellation Aries in that the priest in Egypt saw a star representing the coming of the Messiah or even Moses (Cassiopeia is above Aries, the Ram). The history of the Menorah begins in the book of Exodus where he was instructed to build a golden lampstand upon which seven lamps were positioned and outlined in Exodus 25:31-40. In these verses are references to a candlestick, 6 branches, bowls, knobs and flowers (leaves, and fruits--almonds), and a talent of pure gold. These descriptions continue on into Exodus chapter 37 regarding rituals. The almond tree figured prominently in the design of the Menorah. The Hebrew word for almond (Heb. shaqad, shaw-kad', a denomitive from Heb. shaqed, shaw-kade', the almond (tree or nut), from Heb. shaqad, to be alert, thus meaning to be almond-shaped. Some sources claim that the Hebrew word for almond, resulting in (luz) has become a root for "light" in other languages. The first-century Jewish historian, Flavius Josephus, also described the Menorah built for Moses by Bezaleel: Antiquities of the Jews, Book III, Chapter VI, Paragraph 7. Some promote that the first seven books, Genesis through Judges form a menorah, which corresponds to seven thousand years of Human history. The fourth book, Numbers, corresponds to the Servant Lamp, giving the account of Aaron lighting the Menorah in Numbers 8:2-4. If Genesis through Judges is equal to 7000 years of human history I can personally equate the years of the Judges around 1300 B.C. Therefore 1300 plus 7000 years would equal 8300 B.C. Now this is quite a coincidence since in this book "The Alpha and the Omega" the period that Adam�s creation and fall came is in the Age of Cancer 8850 B.C., then Noah in Gemini 6690 B.C., Abram in Taurus 4530 B.C., Abraham�s covenant in Aries 2370 B.C. was revived after the birth of Moses around 1620-1525 B.C. Medieval tradition saw the period of Aquarius as the end of the 'time of secrecy.' The Kabbalah texts were not to be published until the approach of the 'fulfillment of the time,' the revelation is drawn from the Tradition itself, that the time of secrecy has ended. From the depths of time the Kabbalah texts deduced that in the 'time of Aquarius,' men would transmute metals, make their voices travel all over the earth, move mountains, making flying machines and walk on the moon. Moses introduced the Kabbalah and called it 'shalshelet ha-kabala,' meaning 'chain of the Tradition.' The changing of so much as a single letter of the sacred texts is the abomination of abominations, one of the most infamous sins. It states that when the "time has come," man will be able to know and understand what 'aleph' symbolizes. This first letter of the Hebrew alphabet, represents the One, the Unity of Principle that is ineffable for men. The Tradition promises a "bow" set in "the clouds" to those persons who have maintained its chain. As to the descendants of Hobah, the brother-in-law of Moses (Judg. 4:11, probably the Midianites), who visited him when Israel left Sinai and he invited him to act as pathfinder (Num. 10:29-32) which he did. Mythology: Arabic Ophiuchus - Greek Aesculapius - Egyptian Akhenaton"
Two mummified fetuses found in the tomb of King Tutankhamun will undergo DNA testing to determine their relation to the famous pharaoh, Egyptian officials announced today. The fetuses may also solve a longtime puzzle: the identity of King Tut's mother. Editor�s Note: Notice that King Tut, his Father Akhenaten, Queen Nefertiti all the various relatives have exceptionally large heads possibly associated with extraterrestrial life forms. The photo of a fetus found in King Tut�s Tomb looks similar to descriptions of ET. These unusually long cone heads may represent a distinct race and not just be deformities..
King Tut reigned from 1336 to 1337 B.C., is thought to be the son of Pharaoh Akhenaten and his wife Kiya. But some archaeologists believe he could be the son of Akhenaten's other wife, the powerful Queen Nefertiti. Akhenaten ordered that Egyptians should worship only one god rather than hundreds. He set up a new capital and told his subjects should worship one god. "The fetuses will help us determine whether [King Tut's wife and daughter of Nefertiti] Ankhesenamun was a half sister or a full sister," said Zahi Hawass, secretary general of Egypt's Supreme Council of Antiquities. " 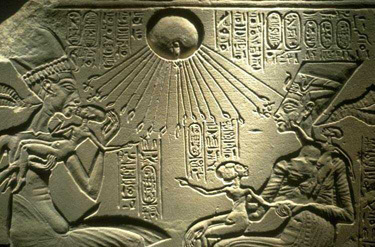 Nefertiti is pictured together with two daughters, but excluding her husband, worshipping below the sun disk. Note the cone heads on all depicted. The testing will also reveal whether the fetuses are offspring of Ankhesenamun and Tut. Scientists caution, however, that they will probably not establish a direct link between the fetuses and Tut because such genetic matches are extremely difficult to prove. 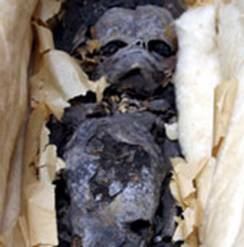 Additionally, mummies of fetuses found in a tomb are not necessarily the children of the buried pharaoh. "I personally feel they are not the sons of Tutankhamun," said Hawass, who is also a National Geographic Explorer in Residence. (The National Geographic Society owns National Geographic News.) "I think they are children put in the tomb to be reborn in the afterlife." Who Wrote the 5 Books of Moses? Isaac Casaubon (~1600AD) who theorized that Hermes Trismegistus did not exist. The Nag Hammadi scrolls (discovered ~1900AD) which invalidate Casaubon's thesis. Egyptologists from Petrie to Aldred (~1900~1980AD) who describe the life and disappearance of Akhnaton. Freud (Moses & Monotheism ~1910~1939AD) who associated (Master-Disciple) Moses with the recent discovery of Akhnaton; his book (and is life) is an interesting chapter of the resistance/ discovery". Velikovsky (Oedipus & Akhnaton ~1960AD) who showed that Oedipus was not a legend but an historical record; he brings therefore the "Oedipus Complex" to a realism that Freud himself would not have dreamt of. Osman (Akhnaten King of Egypt ~1990AD) who shows after Freud that Akhnaton IS Moses since Egyptology is able to explain that he was Hebrew by his mother Tiye. Meanwhile his resistance led him to forget all what he knew with passion during his youth ,when he was specialized in Greek Mythology. It is my impression that with respect to three-borns there are several through our years which could qualify for attention and appreciation. Yes, there are certainly many "three-born" figures in our culture. Yet it must not hide the fact that there are some persons who may have endorse two or three identities. About a same person reappearing - as some would say "reincarnating" - we have Copernicus and Freud according to Lacan (that I believe was not a stupid idea, as I noted it in The Structure of the Discovery). The word "repetition" would be more contextual in this case - however, you may notice in this site an essay about "reincarnation." Renowned Egyptologist Jan Assmann traces the monotheism of Moses back to that of the Egyptian king Akhenaten (1360-1340 B.C.E.). He then shows how the followers of Moses denied and condemned the Egyptians as polytheistic idolaters. Thus began the cycle in whcih every "counter religion" denounced all others as false. Assmann presents a compelling lesson in the fluidity of cultural identity and beliefs. From Library Journal: Despite the misleading subtitle, the principal thesis of this work by Greenberg, a trial attorney and president of the Biblical Archaeology Society of New York, is simply that the monotheistic religion of ancient Israel originated in the Aten cult of ancient Egypt. While Yahwism in some ways resembles Atenism, the claim that Yahwism derives directly from it is probably incorrect. For instance, Yahweh is in origin no benevolent sun god like Aten but rather a god of thunder, cataclysm, and war. Greenberg makes other less defensible claims, for instance, that the genealogies of Genesis 5 and 11 are really Egyptian dynastic chronology in disguise. He energetically pursues this very speculative proposal throughout the entire book. One has the feeling, though, that the author decided in advance what his conclusions would be and organized the sketchy archaeological and literary data to prove it. Dense with footnotes and complex in its reasoning, the book presumes a good background in ancient Egyptian history; it is for specialists, not for casual readers. For academic libraries.-James F. DeRoche, Alexandria, Va.